The Revenant is an oathbound spirit that protects the Sun Goddess's domain. 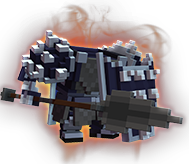 A Spirit Wraith watches over you, saving you from death and joining the fight if it is able, so lure foes to you with a Bulwark Bash and destroy them with Spirit Spears and Spirit Storm. Damages and briefly taunts all enemies in a cone in front of the Revenant. Damages enemies in a cone in front of the Revenant. Costs health to use, and deals damage based on Maximum Health. Basic attacks return a small amount of health, and a Spirit Wraith will spawn to protect you from death, empowering you until it can do so again. A cyclone pulls foes toward the Revenant and randomly fires exploding spirit blasts, which heal players and damage enemies. Costs health to use. Press again to cancel.